What could be better than Sunday night dinner at the original Morton's Steakhouse? That's how I started my Thanksgiving week - an over sized bone-in fillet. It's a long story why we were all there for dinner but we had a great time. I don't know if Morton's would qualify as my favorite steakhouse in Chicago, I don't eat at steakhouses frequently so it's not an issue anyone. Dan has a great story about Morton's, specifically Arnie Morton, so we always enjoy sharing a meal there. 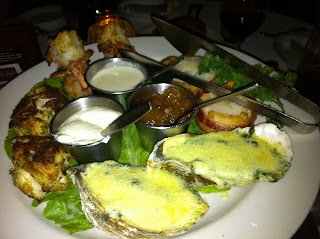 We were a table of six and started with the hot platter sampler, featuring grilled shrimp, oysters Rockefeller, crab cakes and bacon wrapped scallops. Everything was tasty, especially the shrimp and scallops. We also had an order of tuna tartare, delicious, which was half gone by the time I could take a photo and eat a piece. The sauce on the plate was a bit salty, but applied in moderation was fine. This was all in addition to the amazing onion bread that's been there since day one. The main course was, SURPRISE, steak. For first-timers, definitely ask for the whole display presentation. You get to see the cuts in the flesh before making a choice. I decided to try a special, a 13oz bone-in fillet with the au poivre sauce. 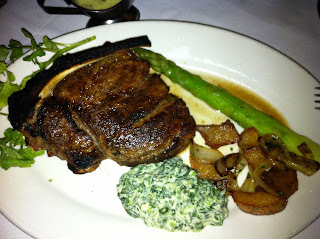 In addition to the meat, the table ordered asparagus, creamed spinach and potatoes. My steak was very tasty, the product of a great formula and the highest quality meat available. I really liked the au poivre sauce, though I know that goes against the purists out there. As much as I like steak, I did not come close to finishing my portion (great for leftovers!). Erica had no problem finishing her petite fillet. The creamed spinach and potatoes were amazing, always solid choices as sides. I am not a huge steakhouse guy and would not feel confident differentiating between the great choices in Chicago. Morton's is the preferred family spot and that is fine by me. There are many good reasons why there are about 80 successful locations around the world (and the meat is always sourced from Chicago). They serve the highest quality steaks and seafood in a classy, old-world setting. Never forget to order plenty of the amazing sides and starters, and enjoy the attentive, friendly and knowledgeable servers. I'm sure I've had better steaks (and cheaper too), but the total experience is classic Chicago with a consistent and timeless product. I've done Morton's, Gibson's and The Capital Grille all in the last year or so and Morton's is by far my favorite. The meat just has that much more char to it. I can never finish my steak though and end up finishing it as leftovers over the course of the next 2 to 3 days! Hey did you do a little site redesign? (Or maybe I just always read through Reader so it's new to me.) If so, it looks great! Very clean and neat. I've had them all. Even Gene & Georgetti! Morton's is definitely my favorite, but Gibson's has hotter women ;) Man up and get the bone-in next time. Also, I highly recommend the Prime Ocean Platter as a starter (if you ever go again). I was wowed by the creamed spinach and the filet mignon. Wine list was fairly overpriced for what it was- though wish I had been able to participate in the Charles Krug "Generations" live tasting that they did. But all in all, a classic "steak" experience. 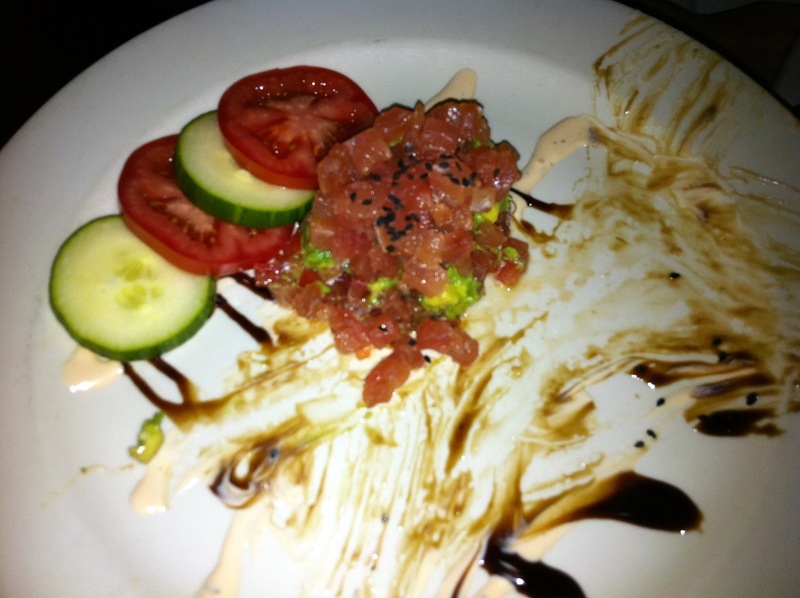 Paul: thanks for the tip on finding the women :) The prime ocean platter was the other option we looked at, next time!